Silica Safety - Pyramid Construction Services, Inc.
Around 2.3 million workers are exposed to respirable crystalline silica at their jobs. Construction workers represent a large portion of those numbers. Workers who cut, drill, or in any way grind down materials containing silica, such as concrete or stone, are at risk. The fine particles that appear as dust or smoke during cutting can damage the lungs and cause silicosis. OSHA has set new standards in the form of the Final Rule which aims to protect workers from exposure. They estimate that the guidelines will save over 600 lives and prevent more than 900 new cases of silicosis each year. On September 23rd, the standards set forth in the Final Rule will take effect. Pyramid is gearing up to meet those standards and keep safety at the forefront of their operations. 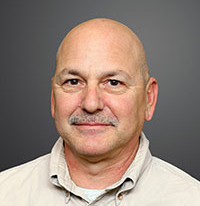 We asked Mike Zellers, Pyramid’s Safety Director and Field Operations Manager a few questions about Silica and how Pyramid is handling the new OSHA standards. 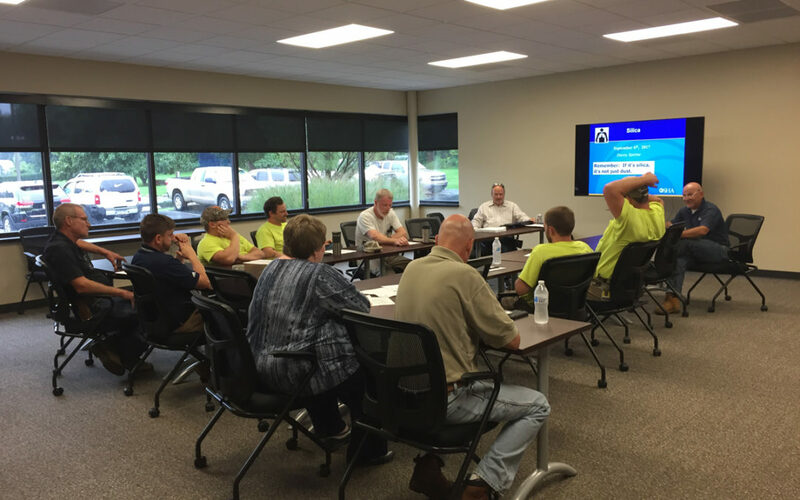 Employees were able to learn about new technology used to combat silica dust. Silica is Quartz, and is found naturally in almost all rock, sand brick and concrete products. How is it harmful to humans? What are the symptoms? What is Silicosis? Respirable crystalline silica particles can penetrate deep into the lungs causing lung disease. Symptoms from exposure to silica can have a range of effects, these may be shortness of breath, loss of appetite, fatigue and cough. Silicosis is a serious lung disease that is non-reversible, it can be acute, chronic or accelerated .It can be acquired from exposure to respirable quartz silica in varying degrees. How many people are in danger of being overexposed? What kind of work/job has the most exposure? Every company that has employees that may be exposed to this hazard must make a determination of which workers may be exposed and what activities that will cause this exposure, and at what level their exposure will be. New OSHA PEL Guidelines just came out, what are they? What does PEL stand for? How is it determined? 29 CFR 1926.1153. Changes the PEL from 250 micrograms to 50 micrograms per cubic meter of air as a time-weighted average (TWA) under any foreseeable condition. PEL stands for Personal Exposure Level. How can someone determine how much Silica is in the air around a work site? The first thing that must occur is a determination of exposure followed by a choice of compliance by using Table 1 provided by OSHA, or by using a monitor to measure the exposure. What can be done to mitigate the problem? Are there any new techniques/technology/tools that Pyramid is using to lessen exposure to silica? 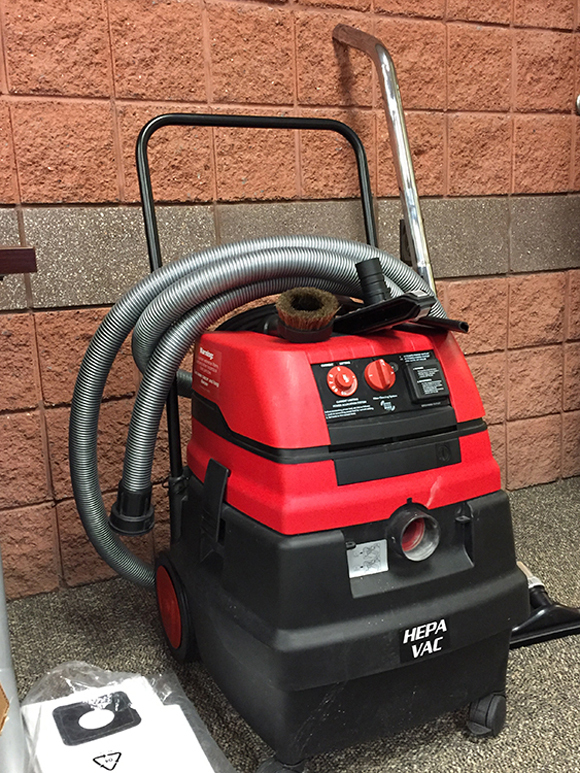 There are many ways to mitigate the hazard, they range from the introduction of water to an activity to the use of HEPA vacuuming along with the use of various respiratory protections. The engineering controls that can be used are a developing industry that has provided us with many tools to help mitigate the problem. Pyramid has been pro-active in our acquisition of all of the most up to date HEPA filtration and vacuum equipment available. We have been actively acquiring the most modern tool dust extraction devices for our inventory of equipment. The other component is the training required by OSHA and the training on the use of all of the new equipment. We feel that we are on track to meet the needs of our workers in this endeavor to provide a more safe work place.